Digital carbon print, 144.8 x 223.5 cm. I think I always have been drawn to photography because I want to construct a perfect world. I want to try to create this moment that is separate from the chaos of my life, and to do that I think I create enormous disorder. And I like that craziness because I think that it creates almost a sort of neurotic energy on the set, and through that there is a moment of transportation. And in all my pictures what I am ultimately interested in is that moment of transcendence or transportation, where one is transported into another place, into a perfect, still world. Despite my compulsion to create this still world, it always meets up against the impossibility of doing so. So, I like the collision between this need for order and perfection and how it collides with a sense of the impossible. I like where possibility and impossibly meet. 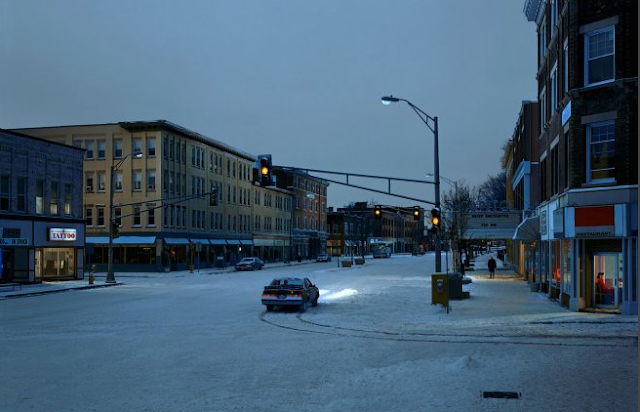 Crewdson creates his work in two contrasting ways, on location or on a soundstage. All on location settings are in Massachusetts with real neighborhoods that Crewdson personally scouted for a particular shot. He then works with his team of designers, operators, managers and the city to start creating his ideal setting. Since Crewdson has worked with small cities in Massachusetts for over twenty years he has full support of the Mayor, Chief of Police and the Fire Department. He also hires locals that he features in his photographs to show his commitment to the city. When working on a landscape such as 'Brief Encounter', figures that appear in the photos are smaller becoming submerged in the drama of the scene. When working on a sound stage Crewdson is given the ability to create the world he wants from the ground up. His favorite subject matter seems to be the dark side of Suburbia and its possibilities. He focuses on the collision between the familiar and strange. 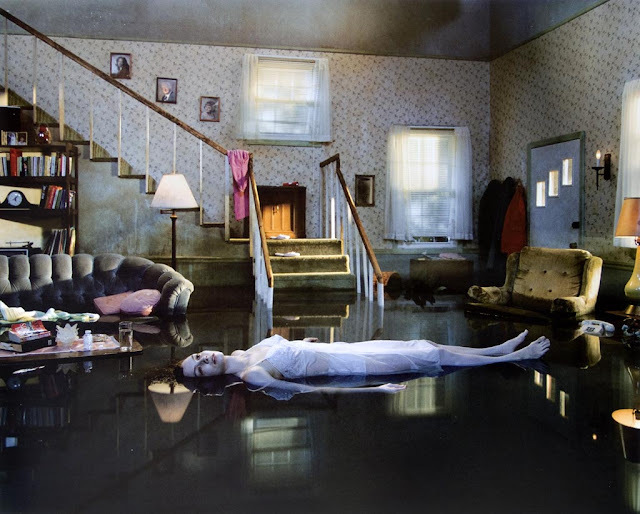 These elaborate sets are often compared to something out of a Spielberg movie but Crewdson claims to be unaware of his scale of production or even its oddity. It often takes about five weeks to sketch and build a set for the end result to only be five or six pictures. 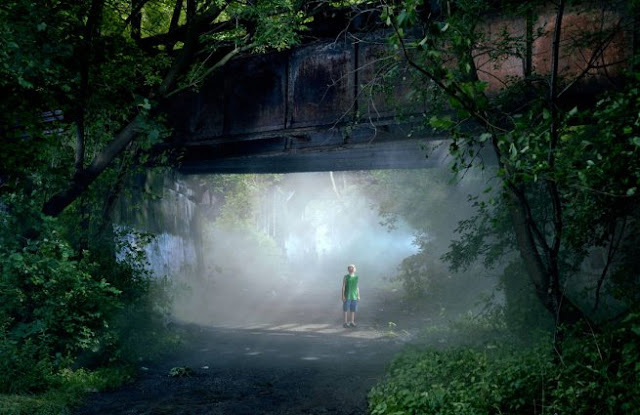 Although both sound stage and landscape photos are created differently, Crewdson's goal is to make them appear as if they are from the same made up world. Crewdson’s work is a creative process that often starts with interpretations of his own dreams and early childhood memories. He strives to create a world within a world that is surrealistically perfect. His attention to detail from his subject matter, hand picked suburban locations and his lighting techniques allow him to be more than just a cinematic photographer. His photographs are psychological and have an unusual balance of pessimistic and optimistic subject matter. He provides photographs with no before or after explanation, allowing the viewers narrative capacity to be limitless.